We are looking forward to promote S4GA lighting for other airports on Maldives. As General Manager at Dhaalu Airport Holdings Pvt. Ltd. I am responsible for managing construction works and procurement of key airport infrastructure-related equipment. 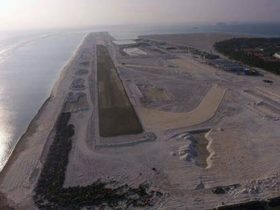 Dhaalu Airport is designed for day and night operations and will be operational 365 days throughout the year. To be able to operate 24/7 we required reliable airfield ground lighting system. At the very beginning we started working towards design of conventional lighting system with one of Maldivian engineering companies. After design phase has been accomplished we received valuation of the system which significantly exceeded our budget planned for AGL. In order to find more affordable solution we have started to look for alternatives. One of the inquiries has been sent to S4GA company which responded with an offer to supply Hybrid (Solar-powered) Airfield Ground Lighting to Dhaalu Airport. – Our airport is located in the area where electricity can only be produced by diesel generator which is both expensive and not ecofriendly. S4GA hybrid lighting works independently of electrical grid. We have ordered airfield lighting system that included: runway, taxiway lighting, control & monitoring interface as well as solar-powered A-PAPI system. After agreed lead time S4GA in cooperation with our freight forwarding agency has successfully delivered equipment to Maldives. Entire system is about to be installed on the runway. On behalf of Dhaalu Airport I am happy to recommend S4GA as highly professional company. We are looking forward to promote S4GA lighting for other airports on Maldives.